W artykule przedstawiono wyniki badań dotyczące nieniszczącej oceny grubości powłok otrzymywanych metodą natryskiwania plazmowego z użyciem laserowej topometrii 3D. 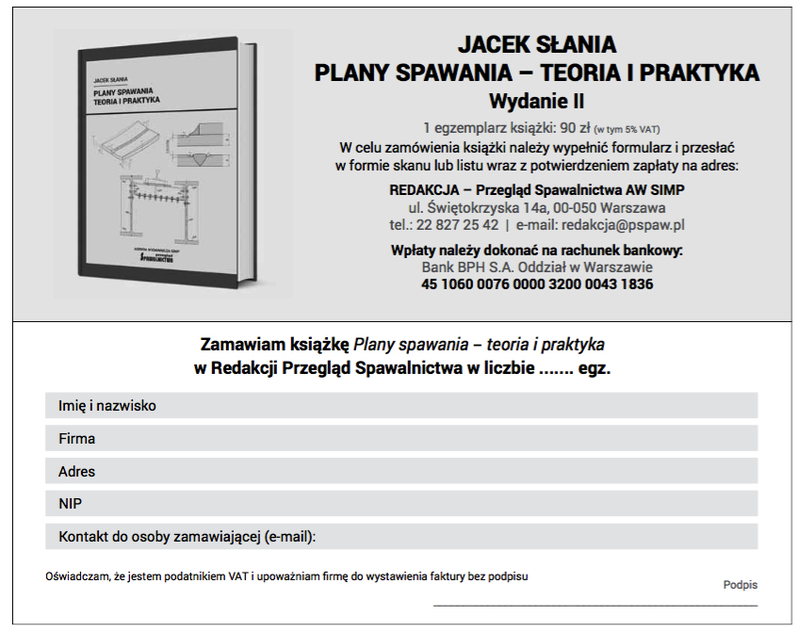 Do pomiarów wykorzystano system ATOS firmy GOm, który pozwala na wykonywanie szybkich pomiarów obiektów przy wysokiej rozdzielczości. Analizie poddano ceramiczną warstwę izolującą powłoki TBC otrzymaną na łopatce turbiny gazowej. Charakterystyki grubości warstwy ceramicznej dokonano w losowo wybranych punktach oraz na przekrojach poprzecznych łopatki. Uzyskane wyniki przedstawiono w postaci wartości liczbowych odpowiadających konkretnym miejscom na łopatce, w postaci kolorowych map odzwierciedlających rozkład grubości warstwy ceramicznej na dowolnie wybranym przekroju oraz w postaci map 3D. Zlokalizowano miejsca na powierzchni łopatki, które charakteryzują się niejednorodnym rozkładem grubości mierzonej warstwy. The paper presents results of research on non-destructive evaluation of coating thickness obtained by plasma spraying using a 3D laser topometry. For the measurements was used GOM’s ATOS system, which is used to perform fast measurements of objects with high resolution. The analysis of the ceramic insulating layer TBC coatings was obtained on a gas turbine blade. The characteristics of the ceramic layer thickness were made at randomly selected points and cross sections of the blade. The results presented in the form of numerical values corresponding to specific sites on the blades, in the form of colorful maps reflecting the distribution of the ceramic layer thickness for any given cross-section and as a 3D map. The parts of layer characterized by a heterogeneous distribution of the thickness were located on the surface of blade. Bevan D.J.m., Summerville E.: In Handbook on the Physics and Chemistry of Rare Earths: non-metallic Compounds I, ed. Gschneider K. A. and Eyring, L. R., north-Holland Physics Publishing, new York, USA, 1979, s. 412. Clarke D.R., Phillpot S.R. : Thermal barierr coatins materials, materials Today, June 2005, s. 22-29. Yu Z., Dharmasena K.P., Hass D.D., Wadley H.n.G. : Vapor deposition of platinum alloyed nickel aluminide coatings, Surf. Coat. Technol., 201, 2006, s. 2326-2334. Schulz U. et al. : Some recent trends in research and technology of advanced thermal barrier coatings, Aerospace Science and technology 7, 2003, s. 73-80. Levi C.G. : Emerging materials and processes for thermal barrier system, Current Opinion in Solid State and materials Science 8, 2004, s. 77-91. Wigren J. Pejryd L.: Thermal barrier coatings-why, how, where and where to. In Proceedings of the 15th International Thermal Spray Conference: Thermal Spray meeting the Challenges of the 21st Century (nice, France, may 1998), ed. Christian Coddet. ASm International, materials Park, OH, USA, 1998, s. 1531-1542. Moskal G., Swadźba L. – opracowania własne. Steckenrider J.S., Ellingson W.A. : Application of Laser Scattering to the Detection of Surface and Subsurface Defects in Si3n4 Component, Ceram. Eng. Sci. Proc. 15, 1994. Clarke D.R., Christensen J.R., Tolpygo V.: The Evolution of Oxidation Stresses in Zirconia Thermal Barrier Coated Super-alloy Leading to Spalling Failure Surf. Coat. Technol., 94/95, 1997, s. 89-93. Peng X., Clarke D.R. : Piezospectroscopic Analysis of Interface Debonding in Thermal Barrier Coatings J. Am. Ceram. Soc. 83, 2000, s. 1165-70. Topygo V.K., Clarke D.R. I murphy K.S. : Evaluation of Interface Degradation during Cyclic Oxidation of EB-PVD Thermal Barrier Coatings and Correlation with TGO Luminescenc, Surf. Coat. Technol., 188-189, 2004, s. 62-70. Stover J.C.: Optical Scattering and Analysis, SPIE Optical Engineering Press, Bellingham, Washington, s. 111-133 (1995). Tomography, marcel Dekker, new York, 2002.